While the Blackbird SR-71 was the fastest manned airplane ever made, the fastest manned aircraft is the North American X-15, a rocket plane that flew for the first time on June 8, 1959, launched from a NASA NB-52B mothership. On October 1967 it pulverized all records: 4,520 miles per hour (7,274 km/h). Ground personnel take care of the X-15 after flight while the NASA NB-52B mothership flights above their heads. NASA pilot Bill Dana was the last man to fly the X-15 (the 199th flight in the series ) on Oct. 24, 1968. In June 1967, the X-15A-2 rocket powered research aircraft received a full-scale ablative coating to protect the craft from the high temperatures associated with supersonic flight. This pink eraser-like substance, applied to the #2 aircraft (56-6671), was then covered with a white sealant coat before flight. This coating would help the #2 aircraft reach the record speed of 4,520 mph (Mach 6.7). The X-15A-2 with the white sealant paint. Design changes for the X-15A-2 included two external jettisonable fuel tanks, longer main gear, lengthened and lowered nose gear, fuselage extended 29 inches, improved windshield design, ablative material on the outer skin, a removable right-hand wingtip to accept test materials, removable lower vertical fin to permit installation of ramjet engines, and accommodations for photographic experiments. After launch from the NASA NB-52B, Air Force Capt. William "Pete" Knight initiates ignition for his record Mach 6.7 (6.7 times the speed of sound) flight on Oct. 3, 1967. The aircraft's special white coating was designed to slowly burn off, or ablate, as it protected the X-15A-2's skin from high heats generated during the flight. The X-15 wasn't free of problems. There were several accidents. First application of the MH-96 adaptive control system that automatically transitioned from conventional flight controls to the reaction control system for high-altitude flight, and back again for descent. The X-15 pilots clown around in front of the #2 aircraft.From left to right: USAF Capt. Joseph Engle, USAF Maj. Robert Rushworth, NASA test pilot John "Jack" McKay, USAF Maj. William "Pete" Knight, NASA test pilot Milton Thompson, and NASA test pilot William Dana. The X-15-3 (56-6672) research aircraft is secured by ground crew after landing on Rogers Dry Lakebed. The work of the X-15 team did not end with the landing of the aircraft. Once it had stopped on the lakebed, the pilot had to complete an extensive post-landing checklist. This involved recording instrument readings, pressures and temperatures, positioning switches, and shutting down systems. The pilot was then assisted from the aircraft, and a small ground crew depressurized the tanks before the rest of the ground crew finished their work on the aircraft. The HL-10 and X-15A2, shown here parked beside one another on the NASA ramp in 1966, underwent modifications. The X-15 No. 2 had been damaged in a crash landing in November 1962. Subsequently, the fuselage was lengthened, and it was outfitted with two large drop tanks. 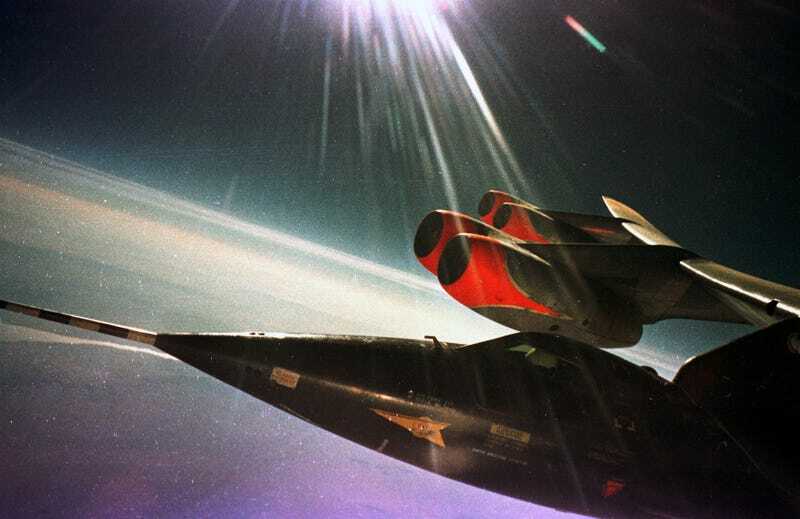 These modifications allowed the X-15A-2 to reach the speed of Mach 6.7. On the HL-10, the stability problems that appeared on the first flight at the end of 1966 required a reshaping of the fins' leading edges to eliminate the separated airflow that was causing the unstable flight. By cambering the leading edges of the fins, the HL-10 team achieved attached flow and stable flight. Cracked canopy glass on right side of X-15 #2 after flt. 2-21-37 on Nov. 9 1961. Robert White, pilot. First flight to Mach 6. The second X-15 rocket plane (56-6671) is shown with two external fuel tanks which were added during its conversion to the X-15A-2 configuration in the mid-1960's.